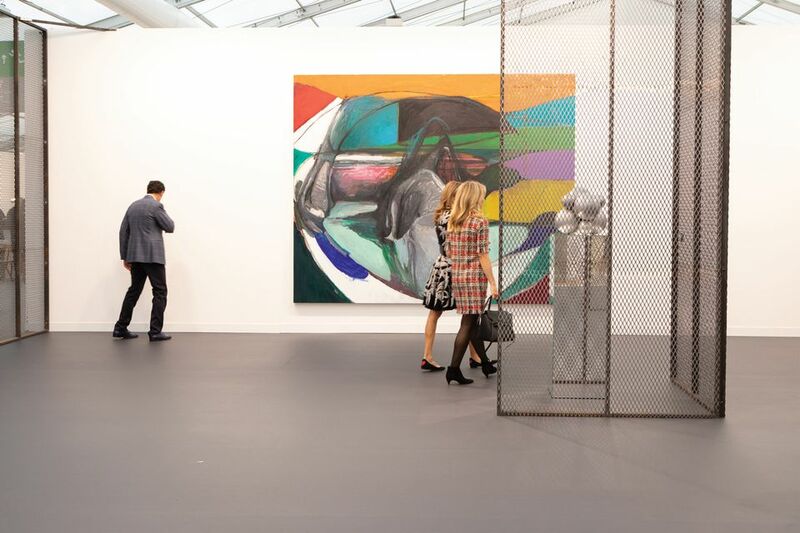 White Cube, the London-based gallery historically associated with the YBAs, has given over its entire stand at Frieze London to a striking display by the Chinese artist Liu Wei. Where once hung spin paintings by Damien Hirst now stands a cage-like construction built by Liu to house his new paintings and sculptures. The majority of the works, priced between £90,000 and £450,000, sold on the opening day. After a decade of Western dealers exporting art to newly wealthy Asian collectors, it seems that this one-way flow is starting to reverse. As with many big international galleries that have recently expanded into Asia, White Cube has promoted its largely Western stable of artists there since opening in Hong Kong in 2012. White Cube’s stand also reflects what dealers describe as a resurgence in the popularity of Chinese contemporary art among Western collectors after a boom ten years ago. “Our focus is to introduce Liu Wei to the West,” says Georgie Wimbush, the gallery’s associate director, noting that French and US collectors are showing serious interest. White Cube Bermondsey is due to host a solo show by Liu in April 2019, with more planned for the US. Adam Sheffer, the vice-president of Pace Gallery, which is celebrating ten years since it opened a space in Beijing’s 798 art district, says that Chinese art has gone from “being a phenomenon that people speculated on to being a reality”. At Frieze, Pace is showing works by two Chinese artists (16% of its roster comes from China, more than any of the other mega-galleries): two porcelain wall sculptures by Yin Xiuzhen, which sold for $86,000 and $68,000, and a new mirror installation by Song Dong, which fetched $65,000. Pace will present an all-Chinese stand at Fiac art fair, in Paris, in two weeks’ time. At Lisson Gallery, a 2018 portrait by Liu Xiaodong of a transgender woman, titled Sasha in skin coloured tights (priced at $350,000), is stopping fair-goers in their tracks. Although the artist is an established name in China, his market is relatively underdeveloped in the West, although his first ever retrospective, at two venues in Düsseldorf this summer, aroused interest from local collectors. There are no immediate plans for Lisson to open a gallery in China, but it is “certainly looking more towards the region”, says its head of content Ossian Ward. Younger Chinese artists are also garnering attention this week. The Hong Kong-born artist Wong Ping was awarded the inaugural Camden Arts Centre Emerging Arts Prize and will have a show at the London institution in the next 18 months. He is represented by Hong Kong- and Shanghai-based Edouard Malingue Gallery, which is participating at Frieze for the first time. The gallery is presenting the artist’s three-part animated film Fables (2018) in an immersive installation. Editions of his works, priced upwards of $12,000, have sold to collectors from London, Paris and Düsseldorf, among others. Jennifer Caroline Ellis, an associate director of the gallery, says that the growing popularity of Chinese artists is simply a result of a more globalised art world, although she notes that few Asian galleries have opened in Europe. They are finding other ways to show their artists abroad—for instance, by collaborating with European institutions and non-profit organisations. Outside of Frieze, Hauser & Wirth, which opened in the H Queen’s tower in Hong Kong in March, is heavily promoting another Chinese superstar, Zeng Fanzhi, with three exhibitions spanning its galleries in London, Zürich and Hong Kong. The strategy appears to be paying off. “For the two shows we have opened, all sold works have been placed in Western collections and all with new Fanzhi collectors,” says the gallery’s owner Iwan Wirth, who added Zeng to his roster in March, bringing the total number of Chinese artists he represents up to two. But is this simply history repeating itself? After all, ten years ago, the market for contemporary Chinese art grew exponentially, but that spurt was short-lived. Not so, says Magnus Renfrew, the co-founder of Art HK, who is launching a new fair in Taipei in January. He acknowledges that there was a “period of intense interest” between 2006 and 2008, during the “heyday auction market for Chinese contemporary art, which was fairly uncritical”, but a correction followed in 2010. Renfrew says the “institutional scene is developing rapidly” in China, lending critical and curatorial clout to a new generation of artists coming up through the ranks, as well as those who survived the bust.